I finished my Quaker biscornu. Carolyn from Just one more Stitch RAk'd me this lovely design. Now I would like to pass it on to someone who would like to stitch it. Leave a comment stating you would like to be entered in a draw to receive this lovely pattern on this post. I will do the drawing in a week. 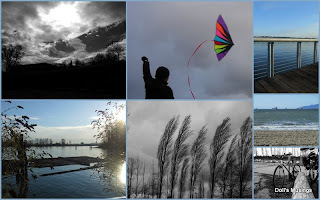 I have had a splendid week of cycling, kite flying and stitching. One more week and it's back to the grind. A Prairie School finish. Stitched on 32 Limestone Belfast with DMC threads. I have an idea of a nice finish for this which I hope to get done this week. Stay tuned! My little basket of smalls is growing. I hope to replace the St. Patrick's finishes with some Spring finishes. That's all from me for now. I hope you all have a wonderful week! Lovely work on that Biscornu! Congrats on finishing it! I love to fly kites too! Enjoy the time off! Hugs! Such a pretty Biscornu and love the Spring design.Look forward to seeing more of Knot Garden.Your getting a nice collection of little finishes. I love your biscornu finish it's so pretty :) Can't wait to see how you finish the PS Spring finish too! Please don't enter my name in for the chart giveaway, I'm just not stitching right now. Such a pretty biscornu :) congrats on your work sweetie! I like the photo of Titus studying your handiwork. Beautiful biscornu, love it! Enjoy seeing your basket of smalls, looking forward to more ha ha! Wonderful finish on your biscornu! Those always look so complicated to me. 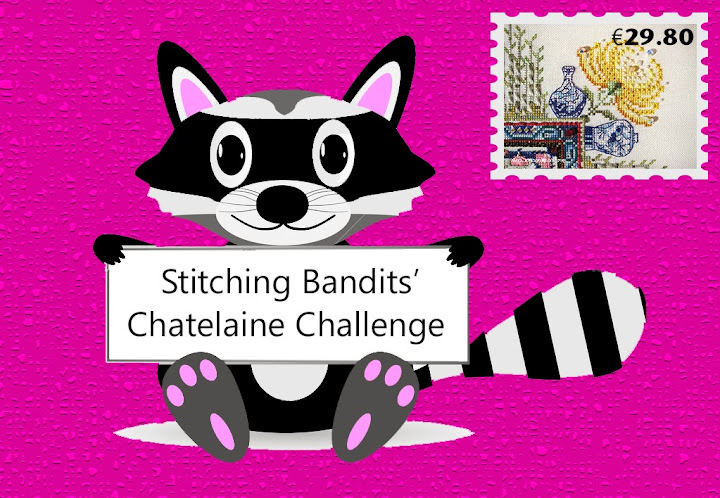 I hope that you enjoy your next week off and have a lot of fun and time for stitching. I love all your stitching! The biscornu is so pretty! I'm so glad you've been enjoying your spring break. Sounds like you're getting good use out of your new bike! Sounds like a wonderful week. Very nice stitching. Love that biscornu. Goes perfectly with all those fun activities. And your kitty loves it too! Your finish is just perfect and I totally love your pretty basket of smalls!!! Your biscornu is very pretty. Did Titus give it his stamp of approval? A lovely finish and great photos. Please don't enter me in your giveaway, I have more than enough for the time being but thank you for the opportunity. Your finishes are so pretty (hey--that PS looks very familiar!!)... Enjoy the remainder of your break and keep that basket of smalls growing! Oooh, beautiful finishes! I'm loving that biscornu too - please enter me in the draw! Also, I kind of want to eat Titus's face :D He's so cute! I enjoyed seeing all your stitchings! No need to add me to the drawing for the biscornu but it's a great design! I like all your smalls you have shared today. Glad you are relaxing Anne. Wishing you and Lee a Blessed Easter. 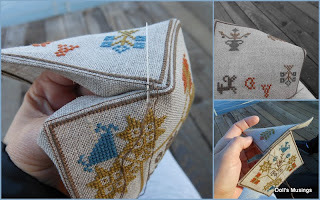 wow biscornou's are so sweettttttttttttttt and lovely stitching too..
Congrats on the finish! I love way the colours go together. I love making biscornu pieces..... love yours and please do drop my name into the draw. Beautiful finish and great photographs. I have this design and I thank you for inspiring me to start it. That is a gorgeous biscornu and I'd love to stitch it please enter my name in the draw!! Lovely PS finish and such a sweet spring design too...can't wait to see how you decide to finish it! All of your 'smalls' are so pretty. Glad that you have been enjoying the weather, biking and kite flying too. What a pretty Biscornu and I love the PS Spring design. Your smalls basket looks great. Enjoy the rest of your vacation! Love all the pretty things in your basket and the biscornu is beautiful. Please don't enter me in the draw for the chart. I have too many on the to do list already! Your spring basket is looking wonderful! Please include me in the drawing for the biscornu pattern. Your Quaker Biscornu is soo pretty & beautiful finish. I would love tot stitch this chart & then pass it on. Very Beautiful looking basket of your stitched treasures. Please don't enter me in the giveaway, I just wanted to say I love the post! Sounds like you are having a nice vacation. I am so behind, I didn't even realize you were traveling! Pretty biscornu finish and lovely stitching! Such a great combination to make a perfect biscornu finish :) Your basket of smalls looks absolutely beautiful! Such a sweet finish and great basket of smalls! Lovely stitching. I would love a chance to stitch the biscornu. Love your Quaker biscornu, gorgeous finish, so sorry that I missed out on going into the draw for the design, although mind you, I have so many patterns in my stash that I will survive the disappointment -lol! Some great stitching happening there, Anne, my love. P.S. Your basket of smalls is looking lovely. Your basket of smalls looks fantastic! You did an awesome job on your biscornu. That's one finish that I haven't tried out yet. Oh your smalls are all looking so lovely!